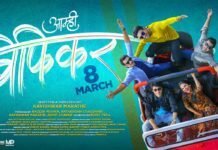 Home Serials Zee Yuva’s ‘Freshers’ title song hit among the youth! It is common knowledge by now that that Zee has come up with a new channel to target just the youth –Zee Yuva. One of their flagship programs is going to be the serial Freshers. As the name would suggest, Freshers is about the life and times of a bunch of young girls and boys who have just ventured into the world of college. The title song composed by Amitraj, who has given us a superhit song like “Tik Tik Vajate Dokyat’, has already become a hit among the youth. Amitraj, Aarati Kelkar, Harshwardhan Wavare and Kasturi Wavare have sung the song whose lyrics have been penned by Valay Mulgund. The video gives us a glimpse of the exciting world in store. The enthusiasm and dreams of young men and women; the beauty of first love; the bonding between friends; the video shows us all. The overwhelming feedback on social media is proof enough of the video being gladly lapped up by everyone. The song includes the seven characters Manva Raje (Rashmi Anpat), Pari Deshmukh (Amruta Deshmukh), Renuka Bhilare(Rasika Vengurlekar), Sayli Bankar(Mitali Mayekar), Nirav Desai (Siddharth Khirid), Samrat Patil(Shubhankar Tawde) and Dhaval Mithbavkar(Onkar Raut). Zee Yuva will be telecast from Monday-Friday at 7 pm from August 22nd.